It is long and narrow and glows an unhealthy green in darkness; it leaks when turned sideways; it is sentient during the first half of its existence and contagious during the latter half; it is bigger than a bread box but smaller than the bread inside; it can almost never be pinned down; 12 of them on ice would make a certain central European despot very happy; it normally smells of cellophane; if it somehow assumed human form, you might catch it dancing the macarena; it is the antithesis of lint; its anagram is "runty ice pinnacle trip." What is it? If you guessed the Gulf of Mexico, you've been hanging around the only parallel universe known to modern science too long. It's true, over there it is the Gulf of Mexico, and is, in fact, the foundation upon which all algorithmic logic is based, but not here. Not now, not ever. Stop and think for a moment. "Runty ice pinnacle trip" contains three visible Ns, plus ten silent ones. How many Ns are there in the Gulf of Mexico? Everyone who says thirty-eight is disqualified. That's how many Ns are floating in the Gulf of Mexico, an important difference. No, the correct answer is the Uncertainty Principle, which was developed by today's featured dead person, Werner Heisenberg. Putting it simply, the Uncertainty Principle states that there are absolute limits on the accuracy to which chaperoned pairs of physical quantities can be measured, assuming that X equals Y and Z equals the circumference of T squared perpendicular to the position of the Delta Quadrant, represented by R over U under Q raised to the power of pie. It’s called the Uncertainty Principle because ... well, no one is really certain. Although scoffed at by persons who commonly hold grudges, the Uncertainty Principle has played a major role in the reconfiguration of the lives of many composers. John Cage, upon learning of it, promptly hid from his family for six months. Arvo Pärt dropped out of Led Zeppelin when he discovered it. Even our own Kalvos, after being introduced to it, abruptly curtailed his fondness for F major and its complement, le flambeau oriange. The Uncertainty Principle, in its basest, most vile form, is part of the scientific view of the nature of physical reality, with implications for philosophy in general and hospitality technology in particular, an issue which I fear I may have to expand upon in coming weeks, but that's another story. And now, a minor historical correction. Although Robert Whitehead -- born 2,088 Fridays ago yesterday -- perfected the self-propelled torpedo by adding to it a servomotor, a gyroscope, and a limited 90-day warranty, he never intended for it to be used in the food fight scene in Bellini's Norma, as has previously been reported. 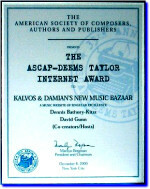 This report -- as have four score and seven others -- is coming to you as an off-line service of Kalvos & Damian's New Music Bazaar, this 89th episode of which is being brought to you by the AOL Class Action Legal Committee, which urges you to turn on, tune in, and avoid computer drop-out by unplugging your system and playing with some wood shavings for a day or two until you can more clearly discern the long, narrow, green and leaky breadbox-shaped principle, which in any other context would be one of the single most identifiable voices ever heard in this radiophonic time slot, a/k/a Kalvos.